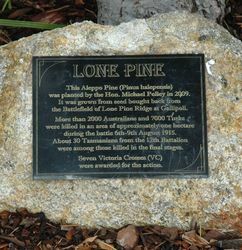 This Aleppo Pine (pinus halepensis) was planted by the Hon. Michael Polley in 2009. It was grown from seed brought back from the battlefield of Lone Pine Ridge at Gallipoli. More than 2000 Australians and 7000 Turks were killed in an area of approximately one hectare during the battle 6th-9th August 1915. 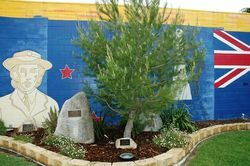 About 30 Tasmanians from the 12th Battalion were among those killed in the final stages.